Zyra's shirt says it all! 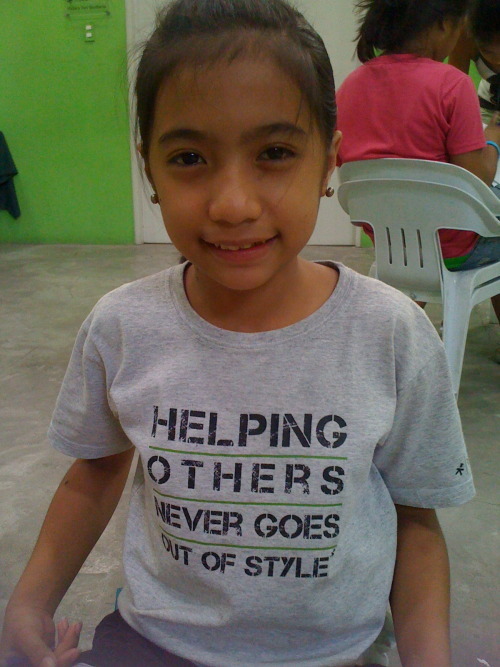 Meet Zyra, one of the newest members of the Girls LitClub in Manila (at the Real Life Foundation). At twelve years old, she is poised and well-spoken, a brave voice with all the makings of a heroine protagonist from a novel. Zyra, my new role model. This past weekend, we did interviews with each other, pairing up two girls to ask questions about life, friendship, and what it means to be a young woman with aspirations. Zyra was my partner, and it was through her that I saw the incredible beauty of a young woman growing into herself, recognizing her potential, and owning her courage. She told me of her pride for her country, that even if she could go anywhere in the world, she'd want to stay here, in the Philippines, the homeland we both share, because she believes in this place. She says she knows everyone here wants to escape, but she wants to be here, to help her people, to help them realize how beautiful this country is. I was awed by her insight, a maturity well beyond her years. She told me that if she could have it her way, she would give the gift of education to every person she meets, because education is the key to a future. In a country of extremely polarized class differences & divisions, Zyra, at twelve years old, recognizes the importance of equality, passionately sharing with me her desire to put up a scholarship program one day, in her attempt to somehow even out the class divide. Her vision astounded me. Her conviction wrapped my heart with hope. These young women prove that there is something worth fighting for. They are our heroines. This past Sunday was my first reunion of the year with the Girls LitClubs at our partner organization, Real Life Foundation. It was so much fun to see the girls again, their shy smiles brightening wider and wider as the LitClubs session unfolded through the day. We read a Tagalog/English book about fathers, and the girls were so eager to get a chance to read- they eagerly volunteered each time we turned the page, and it was encouraging to witness their thirst for their voice to be heard. We talked about the book, shared our favorite childhood memories, sang together, praised one another, and reminded each other of the seven strengths. We had a great afternoon spending time together! Our First Girls LitClub in Manila, Philippines Has Launched! This past Saturday, I headed to the Real Life Foundation Community Center in Pasig City, where the youth of the surrounding neighborhoods gather every Saturday to take advantage of Real Life’s weekend feeding program. The youth don’t often have proper nourishment with their daily meals, so Real Life helps by giving them balanced, nutritious foods on the weekends. The only thing missing from their weekly gathering with youth was a productive program to get them engaged, so implementing the LItClubs was a natural and perfect fit. I arrived to a big group of boys and girls all curious and full of energy, staring up at me as I did my best to communicate with them in the best Tagalog I could. (Luckily, I also had a Real Life Staff member help me with translations!) When we broke up the girls and boys to form their clubs, I finally had a chance to meet the girls and introduce the LitClubs concept to them. We started with the Name Game to warm things up, a practice all LitClub facilitators do to make sure we know each girl’s name. This is very important in our LitClubs, to make the presence of each girl known, welcomed, and valid. I also asked them what they’d like to be when they grow older, and an overwhelming bunch of them aspire to be teachers! (A good sign, no?) We talked about building a community of sisterhood, and exercised their connection with each other by facilitating the identity web activity, where they are able to see how much they have in common with each other by connecting their common traits. The girls may have been shy at first, but behind all the hushed giggles, I can tell they were excited. When we brought out the read aloud, they all gathered close and were completely into the story. I can tell that this is a good beginning, and I will continue updating you all as this new story for LitWorld in the Philippines unfolds!